I’ve tasted some pretty incredible things on my world-wide travels but did not expect for Sicily to offer foods that almost made me speechless. Seriously! Fine pastries in France, fresh seafood in Australia and robust goulash in Budapest all stand out as epic food experiences. What great Sicilian taste made my heart beat a little faster? 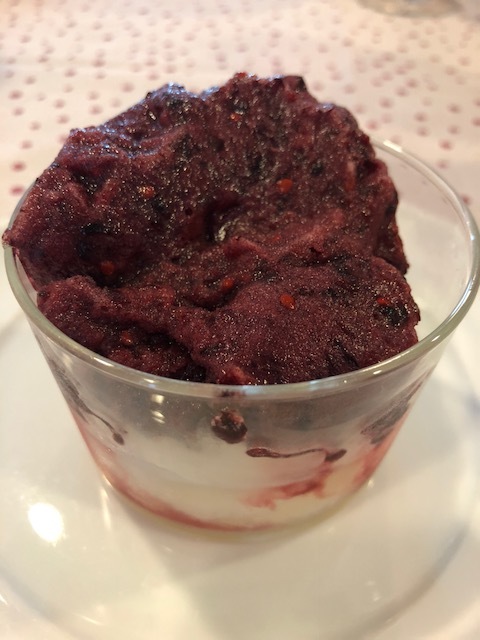 Granita. 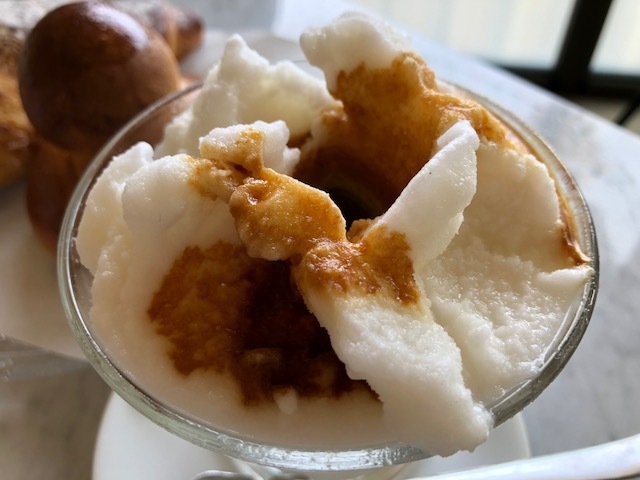 If you have ever tasted Sicilian Granita, you understand. If not, it’s worth the trip just to find out – and fall in love. The warm morning after I arrived in Catania, my host and guide Roberto announced, “You must have a granita for breakfast.” Many “bars” (our version of a coffee shop), offer coffee, pastries and granita for the morning’s greeting. 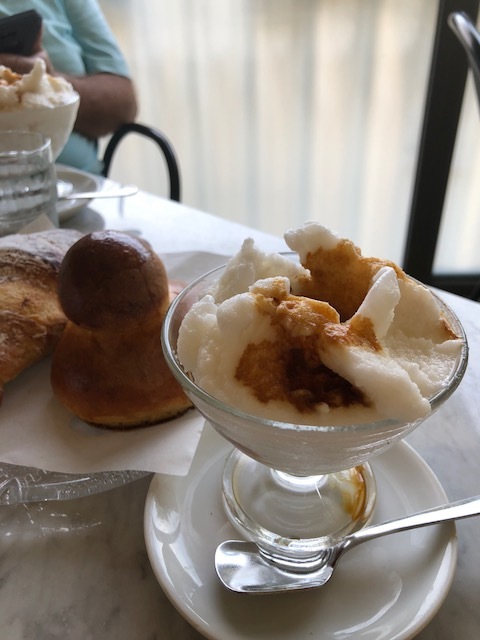 My first introduction to granita made me a true believer in the seduction of Sicilian food. If this was the first of many local foods that made my body quiver with lust for more, how many more Sicilian specialities were on this gorgeous island? It’s not easy to describe granita but I’ll try. Creamy (although there is usually no dairy), fluffy, cold, melt-in-your-mouth, and flavor intense, not sugary sweet. It is not formed with a scoop, like a sorbet, but served a little slushy. It’s made with fine flakes of ice frozen together with sugar and fruit. Other flavors may include almond, pistachio, coffee, or chocolate. 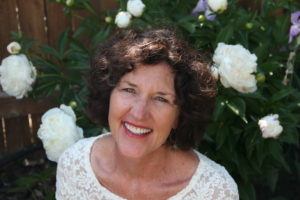 Most bars serve almond, a favorite, coffee, lemon, pistachio and strawberry. This is a Sicilian ritual for breakfast when the weather heats up, accompanied by a warm brioche or other delectable pastry. At the Bar del Santuario, my favorite stop for granita, you saddle up to the counter and order your choice of granita and pastry. Then choose an outdoor table overlooking a lovely park, alive with people and a flowing fountain. A handsome, well-groomed server brings your granita in a stemmed glass dish with a tiny spoon, a plate with your pastry and a glass of water. The only distracting thing on the table – an ashtray. You pay at the cashier inside only upon finishing your breakfast. Two granite and two pastries cost about 5 Euro or $5.75. Yes, the delicious food is much cheaper than the rest of Italy. Affordable for all, locals and tourists alike. Mandorle (almond) with a shot of espresso on top became my fast favorite. Silky almond and sharp contrast of espresso was the perfect marriage, destined to last a lifetime. “Roberto! I want to eat this everyday for the rest of my life!” My emotional side was taking over. The mandorle is made with freshly extracted almond milk, almonds being a key ingredient in many Sicilian foods and also a major player in the agriculture scene. Each day I tried a new pastry to go with it. Buonissimo! (So good!). So addicting is granita that my day just wasn’t right without this starter. 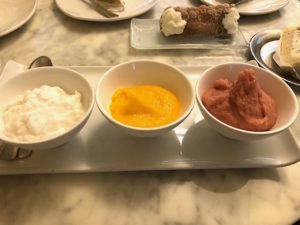 During my two weeks in Sicily, I tried many flavors of granita. Gelsi, or mulberry is a seasonal specialty, and its dark eggplant color mirrored its deep berry flavor. 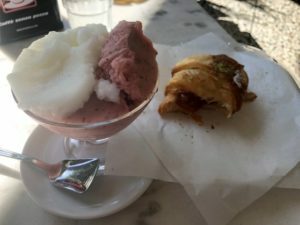 At Caffe Sicilia in Noto, I tried strawberry tomato granita, with a color of rhubarb. Sounds strange but somehow the tomato just barely tames the flavor of the strawberry, pushing forth really ripe tomato for balance that is indescribable. When I asked the person next to me in line which item was his favorite, he quickly replied. “Strawberry tomato granita!” So I was not alone. I was surprised to learn that Sicilians rarely use ice. No ice in water. 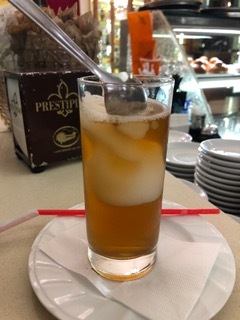 And to cool iced tea – what else? A scoop of lemon granita. Exquisite! My last day in Sicily, I tried half strawberry (with fresh local berries) and half pistachio. Equally yummy. All fruit flavors are made strictly with fresh fruit of the season. 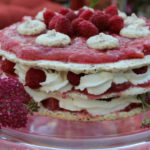 I know you can make it here but it will never match the homemade quality and intensity of flavor only found in Sicily. Yes, I would return to Sicily for the mere pleasure of savoring granita from coast to coast. 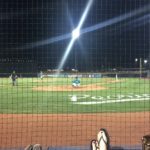 Sicily – this one’s yours to keep!